Ensure that your devices don’t run out of battery when you need them by keeping some power adapters and charges on hand. Consider adding power adapters to your establishment to allow your customers to charge devices such as cell phones and tablets right from their tables. These make great additions to cafes, bars, and hotels looking to provide amenities to their guests and encourage additional purchases while customers wait for their devices to reach full power. 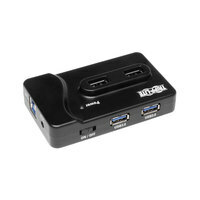 Also make sure to check out other great items from Case Logic, Duracell and Tripp Lite. Find everything you need to create an efficient charging station with our wide selection of chargers and power adapters. We carry USB cables for standard USB ports, as well as for USB-C and Apple-compatible ports. Choose from charging hubs and complete charging stations that allow for multiple devices to be charged at a time. Your customers will appreciate the opportunity to power up their smartphones while they work or enjoy a meal at your establishment. Transform your location into an internet cafe by advertising with menu table tents and tabletop displayettes, and window, door, and LED signs. Provide a strong connection by investing in wireless routers and desktop switches. If you're wondering where to buy power adapters and charges, we have a large selection of chargers and power adapters for sale at the lowest prices.